The Corpse: Sir James Thirkie, the politician renowned for arranging the Peace with Honour with Hitler. Found in his bed, with a Star of David affixed to his chest with a dagger. Inspector Carmichael: An up-and-coming investigator for Scotland Yard. Lucy Kahn: A wayward daughter of the aristocracy whose Jewish husband falls under suspicion. She knows anti-Semitic sentiment will doom her husband if he's arrested, so she must find the real perpetrator first. Lady Thirkie: The deceased's flighty, shifty, newly pregnant wife. Normanby: The deceased's brother-in-law, married to Lady Thirkie's sister Daphne. Has a shot at being the next Prime Minister. Daphne Normanby: The deceased's sister in law - was married off to Normanby after a scandal in her past. A scandal that might have involved Sir James Thirkie himself. Lady Eversley: Lucy's chilling, devious, class-obsessed mother, and one of the leaders of the Farthing Set. David Kahn: Lucy's idealistic Jewish husband, who believes (or at least wants to believe) that England remains a just and decent country, immune to fascism. The Word: How good was this novel? So good, I went out and got the next two books in this trilogy (Ha'Penny and Half a Crown). Consider me a new Jo Walton fangirl. This sinister, layered novel takes the luxurious discontent of an English country house murder mystery and wraps it within the increasing dread of an all-too-likely alternate history. In this version of history, England ducked out of World War II by arranging the Peace With Honour with Hitler - a treaty which guaranteed England freedom from the war so long as they left Hitler to his own devices on the Continent. This peace was arranged by a loosely-connected group of politicians and aristocrats known as the Farthing Set - more specifically, by Sir James Thirkie, whose appeasement of Hitler made him a national hero. However, not long after Sir James arrives at Farthing, the country seat of Lord and Lady Eversley (and headquarters of the Farthing Set), he is found murdered in his bed, a star of David pinned to his chest by his own knife. The novel divides itself between the POVs of two characters determined to find out what really happened. The first is Inspector Carmichael, an up-and-coming investigator for Scotland Yard who is summoned to the crime scene. Thirkie died during a house party attended by all the closest and most influential members of the Farthing Set, so Carmichael knows he'll have to tread carefully in this politically-delicate situation. The second is Lucy Kahn, Lord and Lady Eversley's black sheep daughter who scandalized high society by marrying a Jew. Neither she nor her husband David were expecting an invitation to one of her mother's parties - but now Lucy suspects her parents' olive branch may have been an intentional plot to set up her Jewish husband as a scapegoat. With anti-Semitic sentiment in England on the rise, she knows her husband will be condemned if he's ever formally arrested. But who could have done it? And if it was a member of the Farthing Set - why kill the man responsible for their power and influence? This division of the point of view is the novel's greatest strength. Carmichael and Lucy come from very different backgrounds and their separate observations contribute equally to the final picture of what really happened. Lucy, in particular, is a marvellous character. While she bucked convention to marry a Jewish banker (with whom she is madly in love), she's also very much a product of her privileged environment and upbringing. While more aware than most of the hypocrisy and bigotry beneath aristocratic privilege, she's not above its influence. She's been raised to think of herself as a rather flighty, not-too-clever daddy's girl, even though her tenacity and her loyalty ultimately reveal her to be a much stronger, smarter woman than she thinks she is. Carmichael's investigations, meanwhile, reveal more about this alternate England. While Great Britain outwardly appears bucolic, prosperous and peaceful because it bowed out of WWII early, its decision to ignore Hitler rather than fight him has allowed the disturbing infection of Nazi ideology to take root in its populace. Lucy's idealistic husband David may believe that England is "safe" from the fascism of the Continent, but Lucy and Carmichael come to know better. 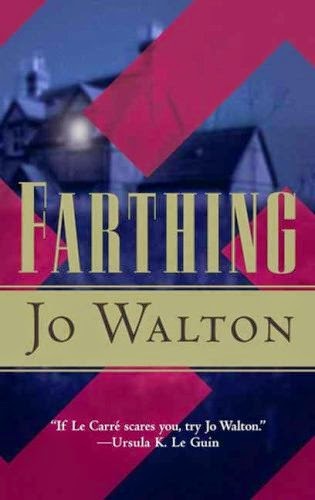 Jo Walton's brilliant novel is gripping, right down to the last page. The intricate mystery, the dynamic characters, and the disturbingly vivid alternate history combine to make Farthing a powerful, and powerfully addictive read. con trai việt nam phần lớn sở hữu làn da ngâm đen. Vậy con trai da ngâm nên mặc đồ màu gì là thích hợp để có thể tôn lên được làn da của mình. hơn nữa, việc lựa chọn quần áo cho con trai mặc cũng rất khó nghĩ. Vậy nên Con trai mập nên mặc quần áo như thế nào? là thích hợp nhất. Khi đi đám cưới, tiếp xúc nhiều với đám đông, vì vậy trang phục đi đám cưới cần được đặc biệt quan tâm. vì khi đi đám cưới cũng là dịp để gặp mặt bạn bè, đồng nghiệp, đối tác. chúng tôi chuyên Cung cấp quần áo giá sỉ giá tốt nhất trên thị trường hiện nay, với những ưu đãi lớn chắc chắn sẽ mang lại nhiều thuận lợi cho quý khách hàng khi mua sắm.